Sweeping north in planet Earth’s sky, Comet Lovejoy’s greenish coma and blue tinted ion tail stretched across this field of stars in the constellation Taurus on January 13. The inset at the upper left shows the 1/2 degree angular size of the full moon for scale. So Lovejoy’s coma appears only a little smaller (but much fainter) than a full moon on the sky, and its tail is visible for over 4 degrees across the frame. That corresponds to over 5 million kilometers at the comet’s estimated distance of 75 million kilometers from Earth. 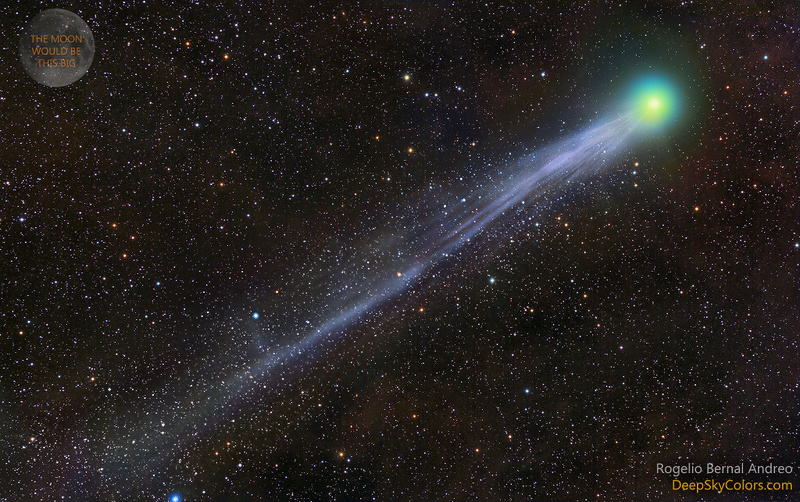 Blown by the solar wind, the comet’s tenuous, structured ion tail streams away from the Sun, growing as this Comet Lovejoy heads toward perihelion, its closest approach to the Sun, on January 30. While diatomic carbon (C2) gas fluorescing in sunlight produces the coma’s green color, the fainter bluish tail is tinted by emission from ionized carbon monoxide (CO+).